As a former Hoosier, I’m always looking for anything Indiana, especially sauces. Hot Doc from Anderson, Indiana makes “Some Call it Hot” BBQ Sauce. Here is a list of ingredients taken straight from the most basic of labels: tomato paste, spices, onions, garlic, vinegar, hot peppers (mostly habanero), vegetable oil, water and sugar. The appearance, color and texture of Doc’s “Some Call It Hot” BBQ Sauce is very good. Obviously, fresh ingredients and no overprocessing goes on with this sauce. I enjoy a sauce that is not your typical mass produced, mass marketed run of the mill sauces. The aroma and quick spoon full, told me I would be using this sauce on chicken. A little seasoned salt, garlic, wooden skewers and a hot fire was all that was needed. A good barbecue sauce to me should be thick, not overly sweet and should help bring out flavors of the foods, not overpower them. Doc’s BBQ sauce did just that. The heat was there but not too hot for a barbecue sauce. Actually, it was just right. The smell of the sauce matched the flavor: smokey and peppery, The tomato was definately the base of this sauce and just a hint of garlic. I noticed no vinegar at all, which is good. I was concerned that the small amount of sugar in the sauce would make caramelization on the grill dificult, but as you can see from the finished product, the chicken browned up nicely. Overall, I really enjoyed Doc’s BBQ Sauce “Some call it Hot”. It is a breath of fresh air to try new BBQ sauces that don’t fill the shelves of every grocery chain. It seems that a few barbecue sauces rule the world and I would really like to see Doc’s sauce be more readily available. 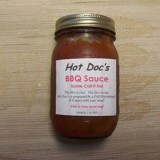 You can give the doc a shout at www.hotdocs-hotsauce.com to order. Be sure and tell him Steve sent you. By the way, the doc is a real doc. You are right my friend. However, I prefer to be called a boilermaker. My sister and wife are Hoosiers. Great review. I just got on HotDoc’s website and sent him an e-mail with my order. He responded quickly, and seems like a very nice guy. Can’t wait to cook with his product!! I guess they can tell us apart from our number of posts!! I tend to post very little, but do check the site several time daily. I used to go under Scott(Dragon835), but decided to go with just Scott. The Dragon835 is a whole other story.